Beautiful and elegant, diamante necklace with matching earrings. - Earring style: Piercing. - Ideal for wedding, banquets, prom or any other special occasions. 1 x Pair of earrings. 1 x Necklace. Sparkly rhinestone detachable shoulder chain necklace with ruffle lace trim. - Characteristic and exquisite design with pleasant color and brightness. 1 Piece Shoulder necklace. - Body chain can highlight your perfect body,make you more confident and charming in the crowd. 1 x Rhinestone necktie. - Adjustable and fun decoration, fit for every fashionable girl. Made with Swarovski Crystal. Swarovski unique cutting, the real item is more sparkling! Elegant and classic heart drop design, perfect for wedding or any other occasion! 18k white gold filled shiny and durable, nickel free! Made with Swarovski Crystal. 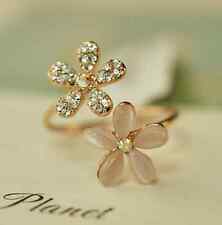 18k rose gold filled shiny and durable, nickel free & hypoallergenic! Elegant link chain: 41cm 5cm extension, perfect length for everyone! A truly wardrobe essential with elegantly flower and teardrop design, perfect for any occasion! Made with Swarovski Crystal. 18k white gold filled with stamp 18k RGP, nickel free & hypoallergenic. StyleJewelry - N55. Beautiful four leaf clover pendant: 26mm(L) x 21mm(W). Elegant four leaf clover design with beautiful heart decorated, good luck to you! 18k white gold plated with stamp 18k RGP, nickel free! StyleJewelry - N290 Beautiful 18k Rose Gold & White Gold Filled Clear Swarovski Crystal Tow Tone Gold 9 Circle Rings Necklace. 18k white gold and rose gold filled shiny and durable, nickel free! Jewelry makes the perfect gift or a fantastic treat for yourself. Gem Type:Sapphire Crystal. Gem Cut:Round Brilliant. Gem Color:white. Germany& French. United Kingdom. StyleJewelry - N167 Elegant Solid 925 Sterling Silver Diamontic Clear Swarovski Crystal Ball Necklace Wedding Bridal Necklace. Solid 925 sterling silver ball pendant with stamp S925 FREE 45cm 18k white gold plated snake chain! StyleJewelry - N220 Antique 18k White Gold Plated 12mm White Pearl Silver Necklace Decorated With Black Swarovski Crystals. Antique 18k white gold plated with stamp 18k RGP, nickel free! Made with Swarovski Crystal. 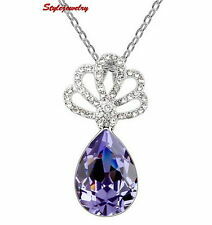 Pendant size: 6.9cm(L) x 1.4cm(W); Transparent clear Swarovski Crystal teardrop: 1.3cm(L) x 0.7cm(W) each. What a beautiful double teardrop design! Always on trend and perfect for any occasion! StyleJewelry - N207 Gorgeous 18k Rose Gold Plated Genuine Swarovski Crystal Lab Diamond Round Drop Necklace. Made with Swarovski Crystal. Swarovski unique cutting, as sparkling as real diamond! 18k rose gold plated with stamp 18k RGP, nickel free and hypoallergenic! StyleJewelry - N64 Beautiful 18k White Gold Filled Silver Diamontic Clear Love Heart Bridal Wedding Necklace Decorated With Sparkling Swarovski Crystal. 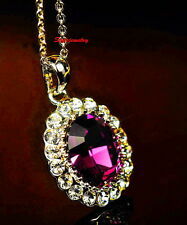 Pendant size: 2.3cm(L) x 2.0cm(W); Central diamontic Swarovski heart crystal: 0.8cm(L) x. 07cm(W). Pendant size:24MM 6MM. Main stone:Strawberry Crystal/Zircon. Item detail. Extension Chain Length: Approx. - Color: Silver. - Length can be adjusted. StyleJewelry - N84 Beautiful Antique 18k Champagne Gold Filled Ocean Blue Cushion Cut Swarovski Crystal Filigree Rose Necklace. Genuine cushion cut Ocean Blue Swarovski Crystal: 12mm x 12mm. Made with Swarovski Crystal. Made with Swarovski Crystal. 18k rose gold filled with stamp 18k RGP, nickel free & hypoallergenic! Elegant chain: 43cm 5cm extension, perfect length for everyone! Made with Swarovski Crystal. Unique cutting of Swarovski, the real item is more beautiful! Beautiful bird wings pendant: 2.3cm(L) x 3.3cm(W). With an elegant and trendy silhouette inspired by bird wings, so different! StyleJewelry - N45. 18k gold/white gold filled, nickel free & hypoallergenic! Available in matching earring and bracelet, check item XE125 & T29. 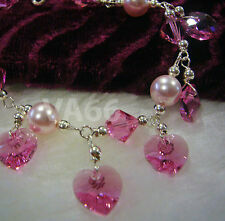 Necklace size: 48cm(L) x 1.1cm(W); each crystal: 2mm. Made with Swarovski Crystal. Swarovski unique cutting, the real item is more beautiful & sparkling! 18k champagne gold filled with stamp 18k RGP, nickel free & hypoallergenic. Elegant link chain: 44cm, perfect length for everyone! StyleJewelry - N295 Beautiful 18k White Gold Plated Peridot Green Made with Swarovski Crystal Teardrop Necklace Super Quality. 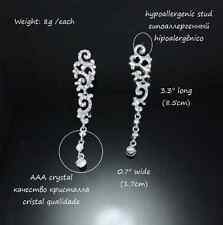 Available in matching teardrop earrings, check our set collections N295IE7! Made with Swarovski Crystal. 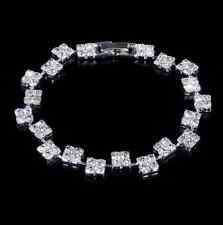 18k white gold plated with stamp 18k RGP, nickel free & hypoallergenic. Great quality chain: 43cm 6cm extension, perfect length for everyone! A truly wardrobe essential, elegantly match with any outfit! `New - Will arrive gift ready in a Silpada Box. StyleJewelry - N219 18k White Gold Filled Angle Wing Necklace Decorated With Swarovski Crystals NEW & HOT! The most popular angle wing design NEW & HOT! For more angle wing design, check picture and item N299! Pendant size: 26mm(L) x 16mm(W); Sapphire blue stone: 12mm(L) x 8mm(W). 18k white gold filled shiny and durable, nickel free! Chain: 41cm 6cm extension chain, perfect size for everyone! Made with Swarovski Crystal. StyleJewelry - N41. Chain length: 84cm, could adjust the bow pendant to any perfect position as you want! Beautiful bow pendant size: 30mm(L) x 30mm(W). 18k white gold filled not tarnish, nickel free and hypoallergenic! StyleJewelry - N72. Made with Swarovski Crystal. Pendant size: 25mm(L) x 12mm(W), sparkling square drop design: 15mm(L) x 12mm(W). Antique 18k white gold filled, nickel free & hypoallergenic! Elegant link chain: 40cm 5cm extension, perfect length for everyone!